Home » News » The Irish Backstop and Trade – What and How Much? This article courtesy of The Maritime Executive, on whose site it was first published on the 25th February 2019. We have chosen to re-publish it as it provides some refreshingly simple and objective data about the actual trade situation between the North and South of Ireland. The Irish backstop solution for Brexit would ensure Ireland’s border with Northern Ireland remains open. In November last year, the European Commission stated that the E.U. and the U.K. have committed that they will use their best endeavors to conclude and ratify an agreement by July 1, 2020 which would replace the backstop. On February 20, 2019, European Commission President Jean-Claude Juncker and British Prime Minister Theresa May said that the backstop provision is temporary. What are the main products and volumes traded between Ireland and Northern Ireland, and Ireland and the U.K. (not including Northern Ireland)? Where does Ireland rank among the U.K.’s trade partners? How important trade with Northern Ireland and the U.K. is for Ireland? 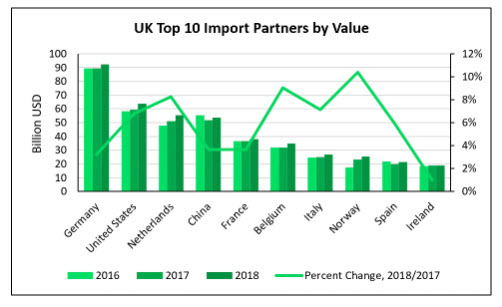 Ireland is the U.K.’s 10th import partner by value. 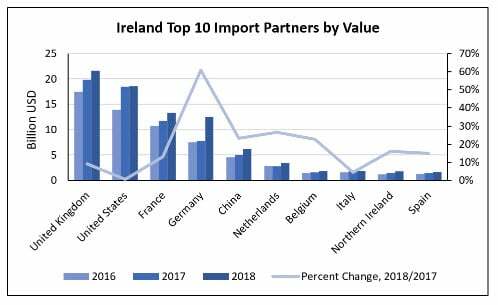 In 2018, imports from Ireland reached close to $19 billion, a share of three percent of the total U.K. imports of $651 billion. 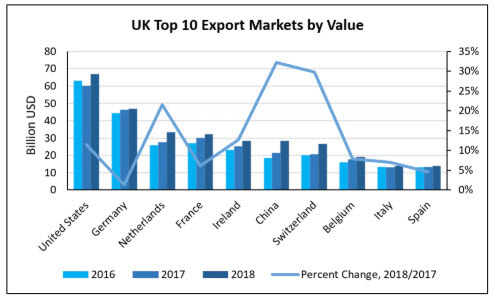 The U.K.’s main import partner is Germany with a 14 percent share of total U.K. imports in 2018. Following are the U.S. with a 10 percent share, Netherlands nine percent, China eight percent, France six percent, Belgium five percent, Italy and Norway four percent each, and Spain over three percent. Ireland exports to Northern Ireland represent 1.4 percent of Ireland’s total exports by value. Exports to the U.S. increased by 24 percent, while exports to Belgium, the second largest export market for Ireland, increased at 44 percent. Exports to the U.K. (not including Northern Ireland) increased by one percent only, while exports to Northern Ireland increased by nine percent. The U.K. (not including Northern Ireland) is the largest supplier at $22 billion, 20 percent of Ireland’s total imports. U.K. exports to Ireland increased last year by nine percent%. Northern Ireland is the ninth largest supplier for Ireland at $1.7 billion. Ireland’s exports to Northern Ireland in 2018 reached $2.3 billion, an increase of nine percent compared to the previous year. Ireland’s imports from Northern Ireland in 2018 increased by 16 percent over 2017, reaching $1.7 billion. Top exports and imports are presented in the figures below. Ireland’s exports to Northern Ireland reached three million tonnes last year, a decrease of seven percent compared to the previous year. 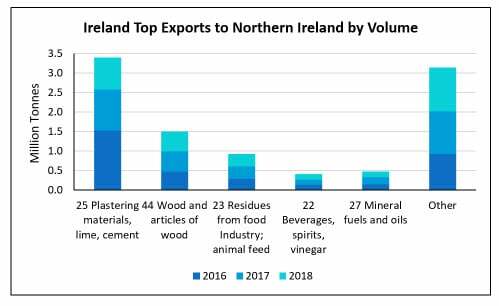 The highest volumes traded were plastering materials, representing a share of 27 percent of Ireland’s total exports to Northern Ireland by volume, and wood and articles of wood at 17 percent share. Plastering materials exports decreased by 23 percent last year, and wood by two percent. 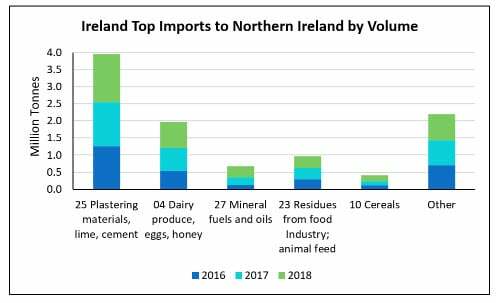 In 2018, Ireland’s main imports from Northern Ireland by volume were plastering materials, dairy, and mineral fuels, followed by animal feed and cereals. Total volume was 3.7 million tonnes, representing an increase of 10 percent compared to the previous year. Plastering materials account for a 37 percent share of Ireland’s total imports from Northern Ireland, and dairy represents 20 percent. 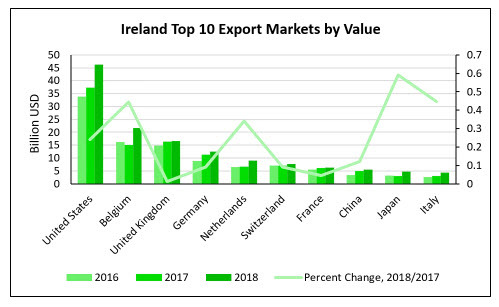 In 2018, Ireland’s exports to the UK (not including Northern Ireland) by value reached $16.6 billion and increased by only one percent compared to the previous year. Imports were $21.6 billion, nine percent higher than in 2017. Top traded products by value are shown in the figures below. Ireland’s exports to the U.K. (not including Northern Ireland) by volume reached close to seven million tonnes in 2018, an increase of five percent compared to the previous year. The volume of imports from the U.K. was close to 14 million tonnes, also an increase of five percent over 2017. The highest traded products are shown in the figures below. Comments on The Irish Backstop and Trade – What and How Much?